Welcome to February! In Australia, February is our back to school month. The new school year kicks off after the summer break from Christmas until the end of January. This week my teens are back to school and I’m back to work at my day job. We’re also hoping for a break in the weather. Australia has sweltered through January – our hottest month on record (since temperatures started being recorded in 1910). The mean temperature exceeded 30C (86F) and where I live (Canberra) we had four days in a row with temperatures exceeding 40C (104F). It’s hard for me to imagine the weather many of you are experiencing in North America with the polar vortex and temperatures colder than Antarctica! At Inspy Romance, we’re celebrating our 5th Birthday in February with our annual Birthday Bash giveaway launching on Valentine’s Day. Stay tuned for more information on our Birthday Bash in the Sunday Edition next weekend. Narelle Atkins’ winner is Chanel Monroe! Alexa Verde’s winner is Sarah Taylor! On Monday, Alexa Verde’s guest blogger Kari Trumbo talked about Why Do Disappointments Happen? On Wednesday, Heather Gray discussed What do we look for in a hero? On Thursday, Liwen Y. Ho challenged us to consider When Does CCR Become Too Preachy? On Friday, Cecelia Dowdy asked for reader input on Do Awards Really Matter? On Saturday, Ginger Solomon discussed the Struggle in the Redo of book covers. Hi Narelle, it certainly has been hot. Today we had the immense privilege of going to For King and Country’s Melbourne concert- my kids first ever concert and it was AWESOME! but SO HOT, 41 degrees! The band must have been even hotter under the lights!! Family in North Queensland are flooded out, while we have bushfires and super hot days- crazy!! Wemble! Thanks for sharing about the EXTREME weather Australia is experiencing. Sound like our spring and summer last year – with the massive fires in California and West but flooding in the Midwest. Areas of our community flooded 3 times last year. The only floods I ever remember in my almost 70 years of life. Experienced a hot summer of temperatures over 40 degrees Celsius – Summer of 1984 in Chicago. THAT must have been a concert! Not sure I could have handled 41 degrees (I top out and start whining not far above 30 – I am SO NOT a heat girl!) but for For King and Country, I’d have been very tempted! Hi Wemble, wow, 41C at the concert is insanely hot! I’m glad you all had a fabulous time despite the heat. The Queensland flooding is scary – praying everyone stays safe. Hi Renate, Interestingly our extreme weather in Eastern Australia can track with California via the Pacific Ocean’s effect on the weather. Australia has always experienced extreme weather. I’m remember being at school in Sydney and watching eggs cracked on the asphalt playground fry quicker than if they were in a pan. There was no cooling in the classrooms other than ceiling fans – not fun! Hi Narelle. Here in central Illinois weather has certainly been cold. This last week we were minus 22 degrees with wind chills making it feel like 50 below. Am looking forward to spring and milder temperatures. Wish I could give you just a bit of the cooler air! Hope you have a blessed week. Hi Narelle! Wishing you cool breezes as you begin a new school year. No fun being in school during extreme heat. In 1984 Chicago experienced extreme heat of a week or more of over 100 degrees Fahrenheit. Our students are finishing their first semester. Not sure what the school will do about the students’ last exams which have been rescheduled four times now, because no school for an entire week. As a retired teacher, who teases her grandkids that I was a slow learner and attended school for 50 years – calling off school for an entire week has never occurred. Not even during the severe blizzard of 1978. This was the first time in my lifetime that the mail was not delivered for two days. This Polar Vortex did not shatter the extreme cold and records in Chicago for January 1982 and January 1985. Between Wednesday and this morning SW Michigan experienced a 60 degree temperature change and now we fear flooding. The snow is melting way fast while the ground is frozen. Looking forward to the Valentine Bash. Best wishes. 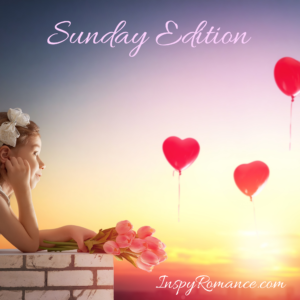 Happy Sunday InspyRomance authors and readers! After all the fires these summer (California) we are blessed with the rains! Praying that everyone stays safe in the extreme weather. Hi Natalia, I’m glad to hear you’re getting some winter rain. :) Tasmania is the only part of Australia that has been experiencing really bad fires, which is a miracle considering all the storms we’ve been experiencing on the mainland. We got 40 again yesterday but going for 28 today. its been up and down with more heat coming this week but not 40 (although we got it twice in the past week when we were going for 37). The kids went back to school last week here. I like it when I was a kid and we went back a couple of weeks into Feb and we use to get 8 weeks for the Christmas holidays. With this heat its hard to get back into the swing of things isn’t it. Hi Jenny, yes, those 8 weeks of summer school holidays were wonderful. That’s back when we had 3 school terms with May and August holidays, and Easter was a 5 day holiday weekend with kids day at the Royal Easter Show in Sydney on what I used to call ‘Easter Tuesday’. :) I think the worst part of our heatwave has been the hot overnight temperatures with 20C plus minimums. All our environmentally-friendly 7 star government buildings are failing to cool down because the overnight temps are too hot to cool the buildings when the windows near the roof open. The constant heat is exhausting.